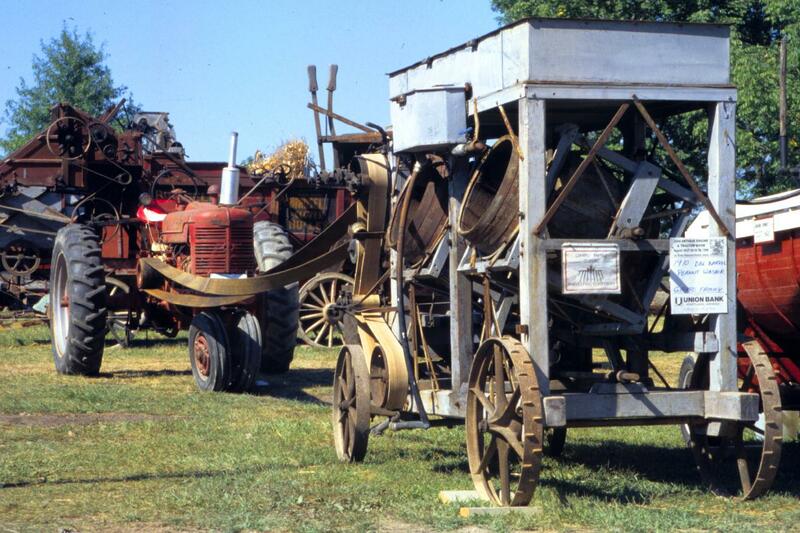 My favorite displays are those where you can watch farming operations being conducted as they would have been many years ago, using the original equipment. 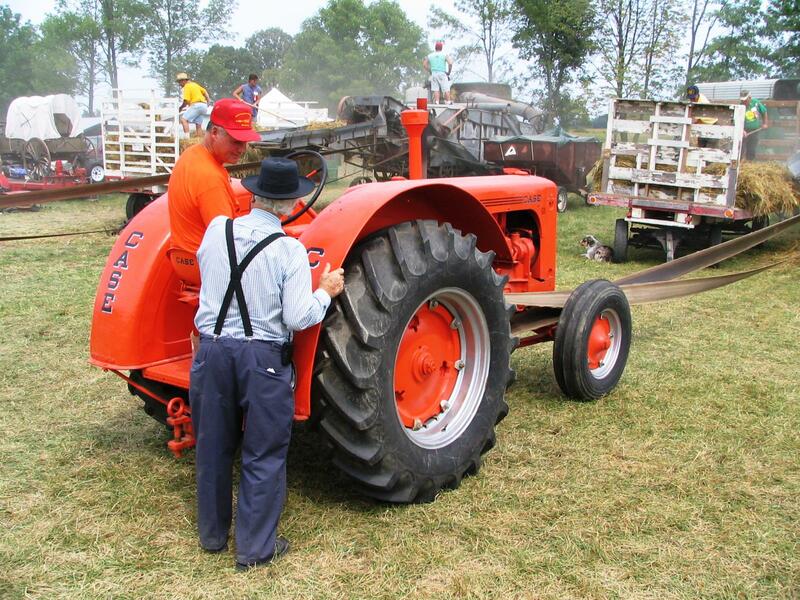 The Girard family of Decatur, Indiana, and points west puts on a terrific show every year at the Tristate Gas Engine and Tractor Show in Portland, Indiana. 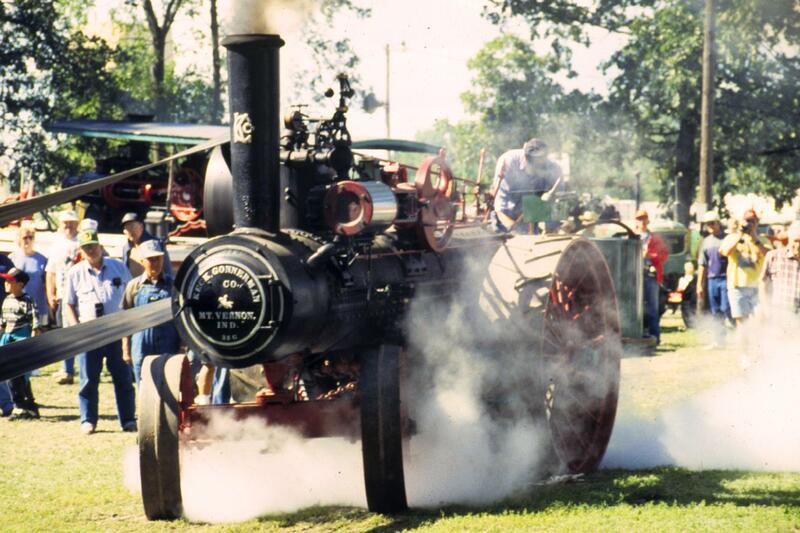 Here's their 1910 double-barreled peanut washer, powered by a nicely weathered Farmall M. Some more photos from their 1998 demonstration. 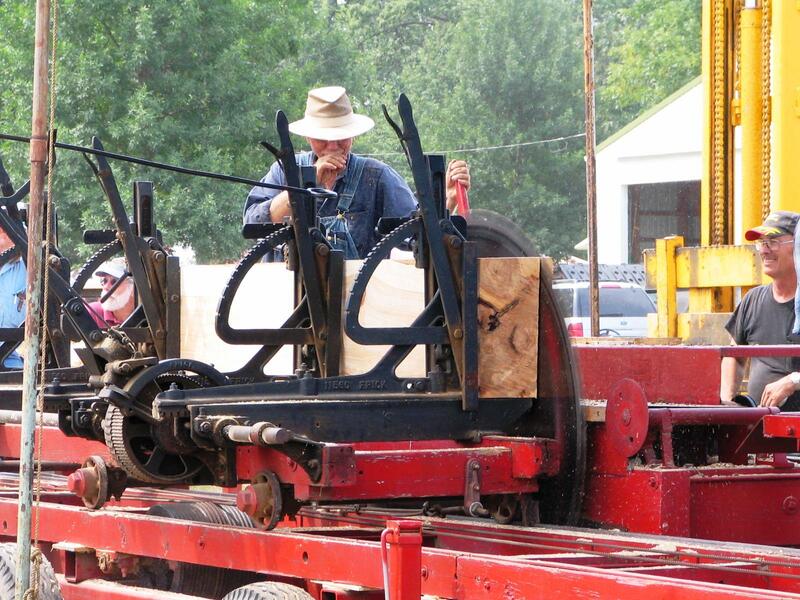 A Keck-Gonnerman steam tractor working out on the dynamometer. I don't know much about these machines, but they're sure awesome to watch--tremendous power and lots of work to run them. Just getting the belt up over the top of that pulley, eight or ten feet in the air, looks like it takes real work, skill, patience, and maybe some luck. 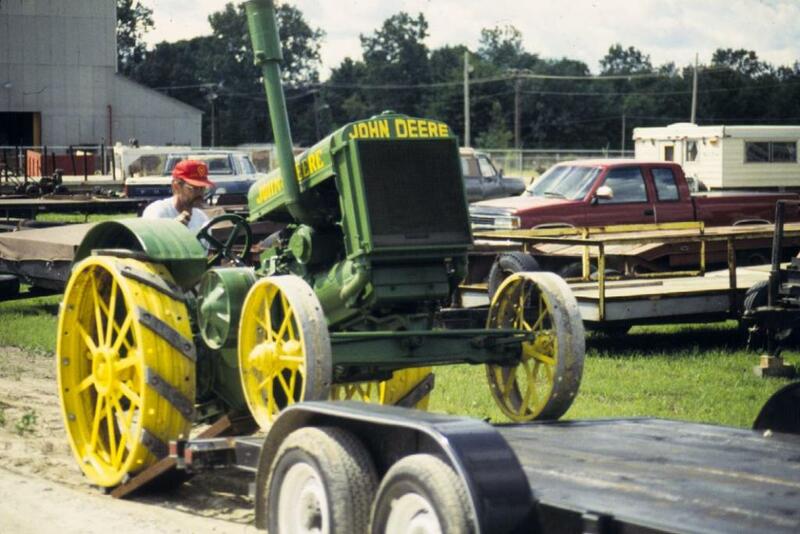 Brice Adams loading his 1928 John Deere D for the trip home from Portland in 1997. Horsing that big tractor, with its steel wheels and loose steering linkage, onto a small trailer is not a task to be taken lightly. Brice had generously let me drive the D for a while, and I was amazed at how big it seems from the operator's seat. I'd always thought of Ds as somewhat small tractors, since they aren't tall like the Farmall Ms and John Deere As that I'm more familiar with. But once in the operator's seat, way back and low down, with all that long, wide steel in front of you, a John Deere D is a big machine. 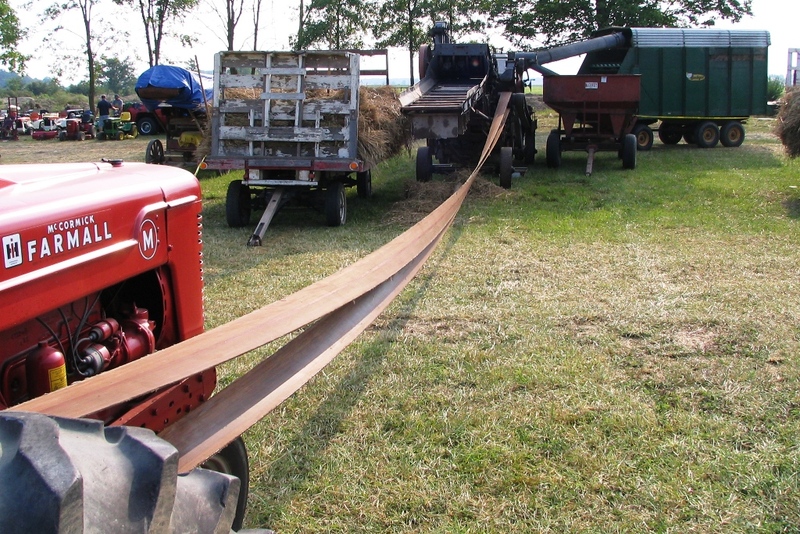 At the Darke County Steam Threshers Association show in July 2009, a Minneapolis-Moline U pulled a McCormick-Deering grain binder, cutting and binding wheat into bundles ready for threshing. 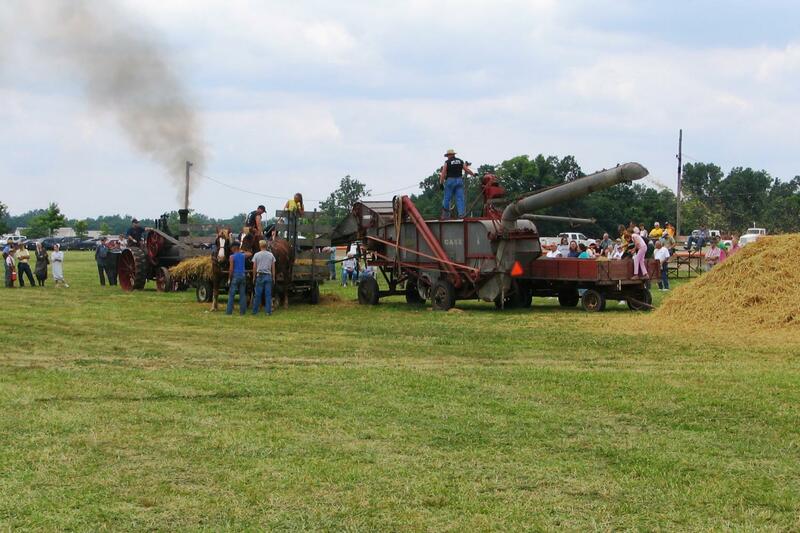 A crew with a horse-drawn wagon later picked the bundles up and took them to the old Case thresher, where the windstacker deposited a big pile of straw for the kids to play in later. 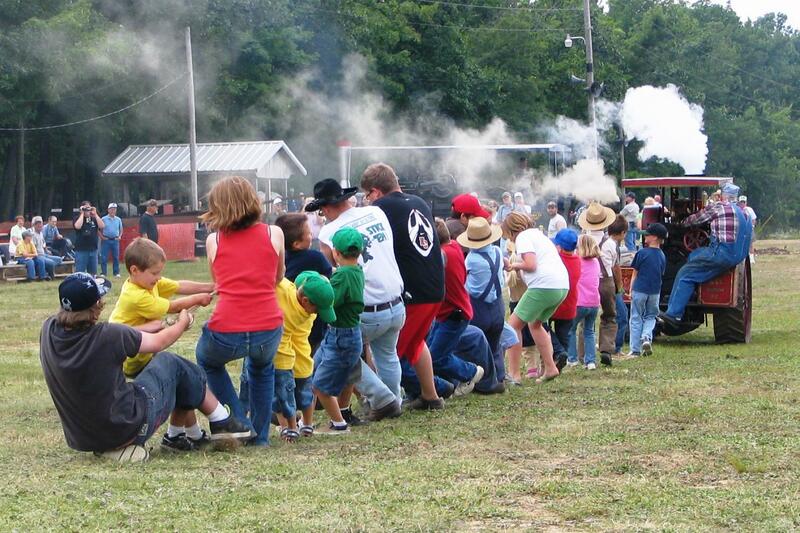 Also on the entertainment schedule was a tug-of-war between a 1/2-scale handbuilt steam tractor and all comers... even with some adults helping the kids pull, that little engine definitely could. 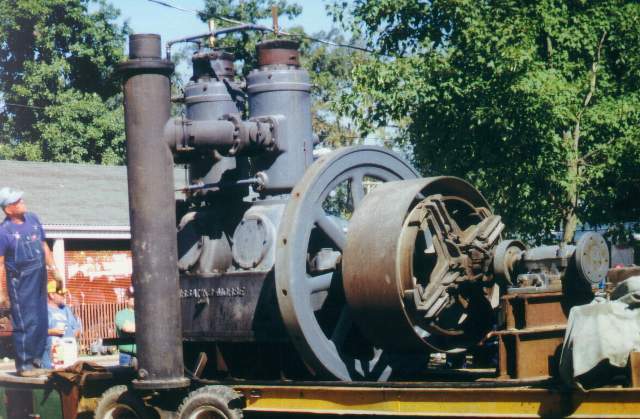 The 1923 Fairbanks-Morse 100-hp engine, one of the permanent features of the Portland show. 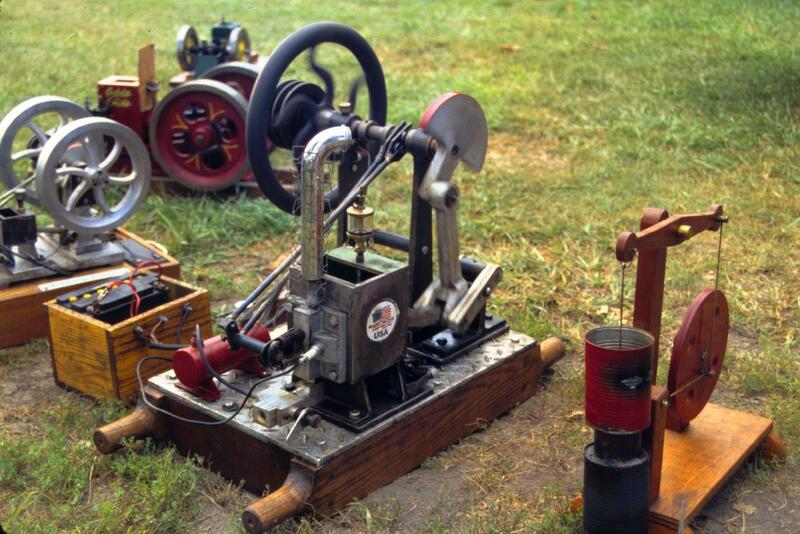 The almost gentle, low-frequency sound that stationary engines make, with their "hit and miss" ignition cycles, appeals to me on a fundamental level. It's sort of like the "Poppin' Johnny" two-cylinder rhythm--you can't help but like it. 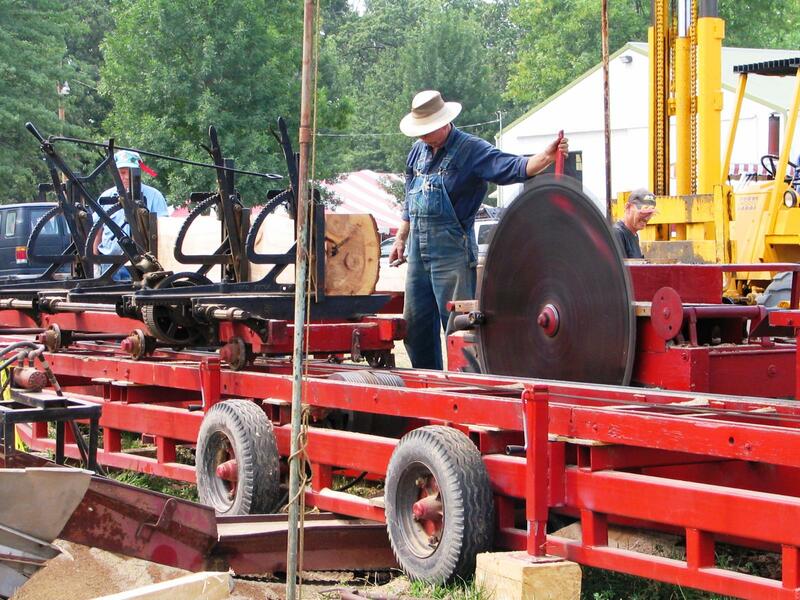 Here's a 30-second sound clip of this engine running (with several other stationary engines in the background). Near the other end of the size scale at Portland that year were these engines scratch-built by a machinist from Smithton, Pennsylvania. The large engine in the middle is an Atkinson-cycle engine: Because of the knee-action crank, it runs through all four combustion cycles in a single rotation of the crankshaft. The small, wooden-armed engine on the right is a hot air engine, using the alternating pressure and vacuum in a heated and cooled cylinder to operate the piston. The source of heat is a small alcohol flame underneath the black tin can. 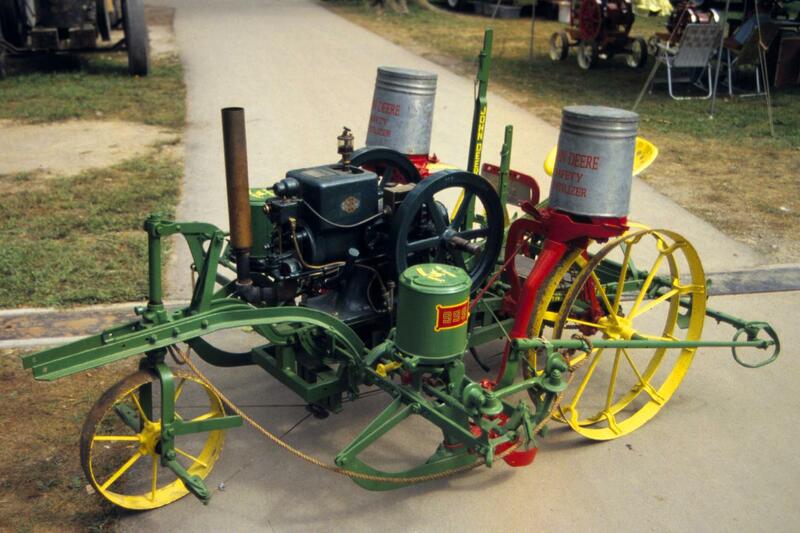 An early-thirties John Deere 2-row corn planter, on which Jack Pace of Montpelier, Indiana mounted a 1927 McCormick Deering 1-1/2 hp engine and a Wheelhorse lawn-tractor transmission, so he can putt around on the thing. Sounds great to me. 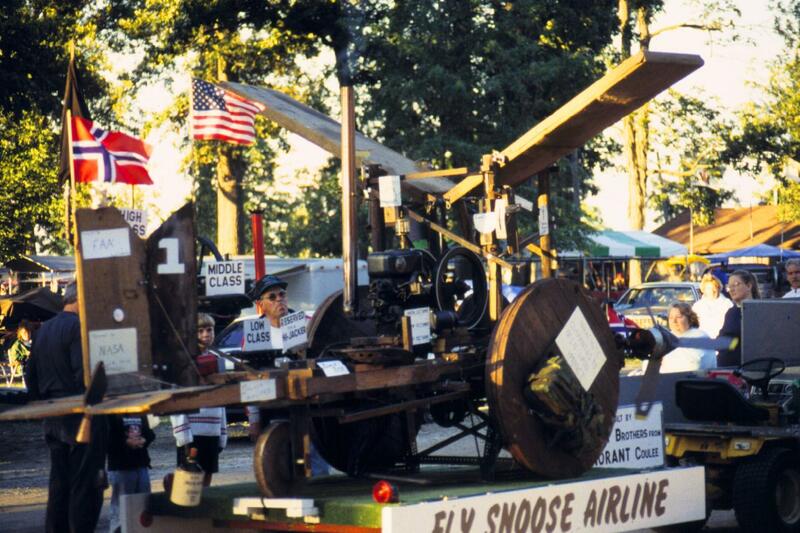 The "Snoose Airline," built by Paul Onsrud, of LaCrosse, Wisconsin. A Hercules stationary engine makes the propellers spin and the wings flap. Paul admonishes skeptical observers "not to look at his airplane with that tone of voice." 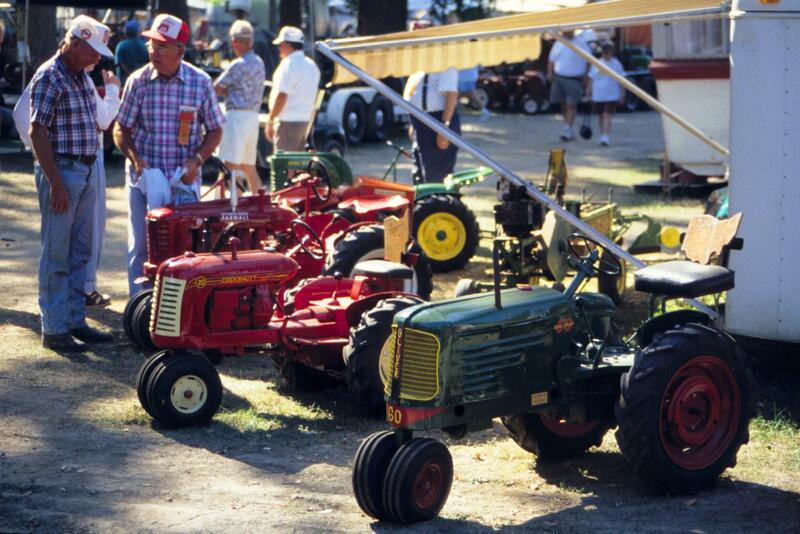 An outstanding collection of miniature, working tractors: John Deere L, Allis-Chalmers G, Farmall H, Cockshutt 20, and an Oliver 60. 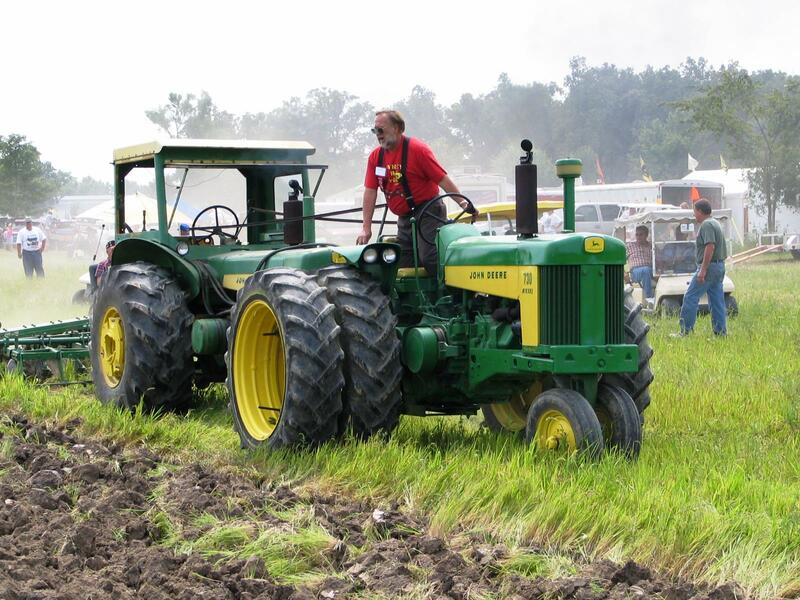 All were built by Bud Hengstler, Richard Etzkorn, and Bob Zink, of Wapakoneta, Ohio, using their full-size tractors as models. 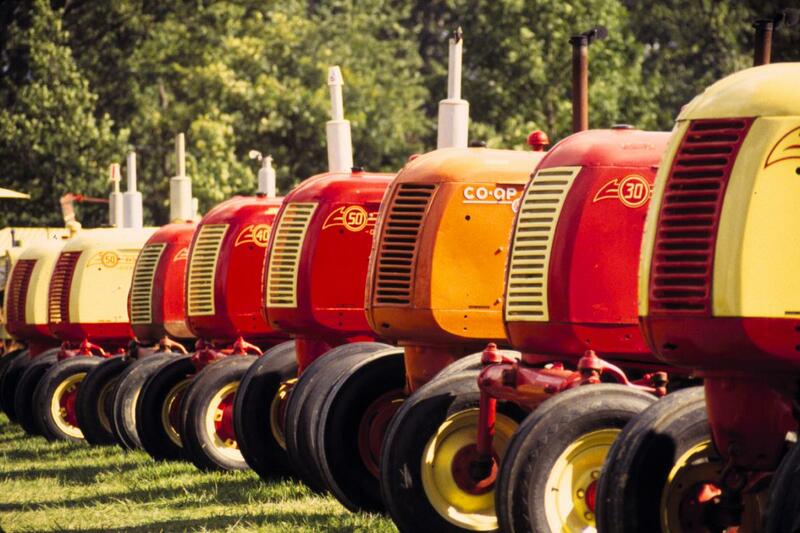 All are 1/2 scale, except for the Allis G and JD L, which would have been too small at that scale. Many of the photos here were from the show at Portland, which has an amazing variety and quantity of displays, parts vendors, crafts barns, and activities. 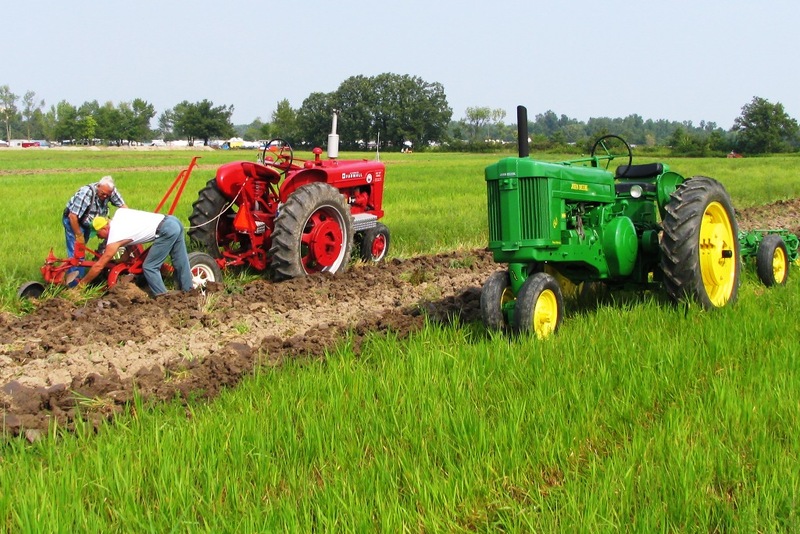 For several years it's been a gathering place for subscribers to Antique Tractor Internet Service mailing lists. With apologies to Clement Moore, here's a little more about the show. 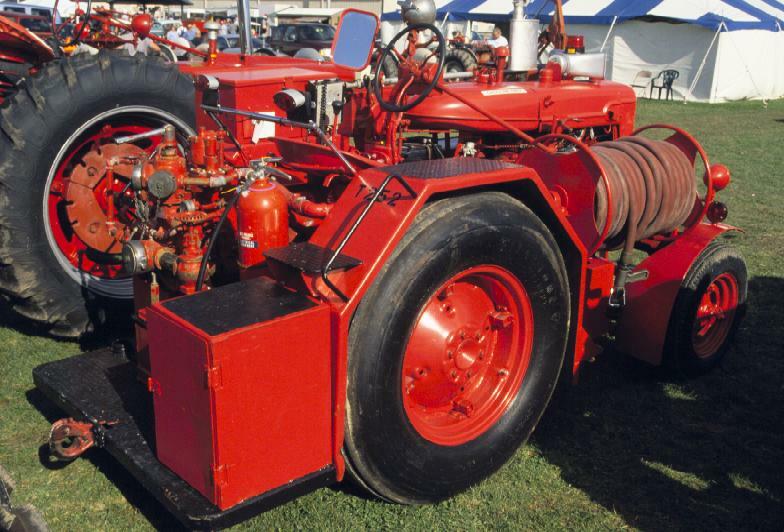 Fire engine built on a Farmall A, on display at Old Timers Days in Xenia, Ohio, in September 2003. The water tank is underneath the tractor. Tall toolboxes are attached to the left side of the engine. 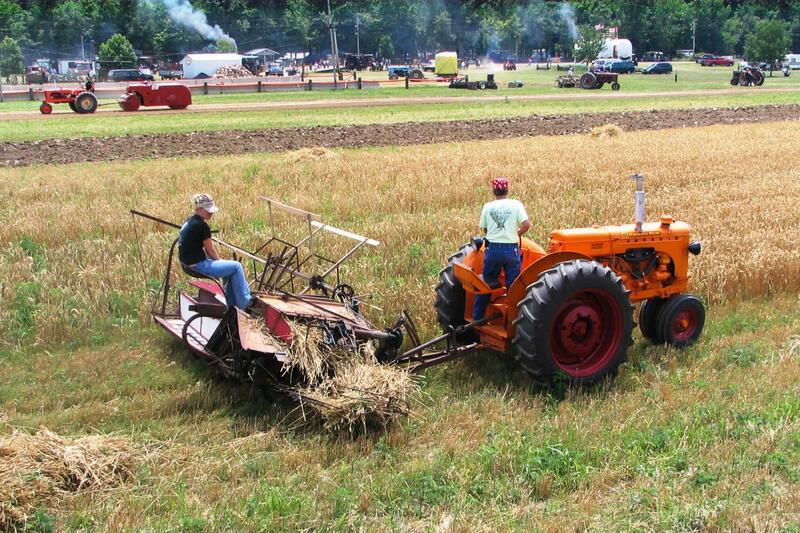 The water pump is mounted in line with and driven by the PTO. Nice diamond-plate steel deck around the operator's platform, sort of like on a standard-tread tractor, with a pintle hook on the drawbar. 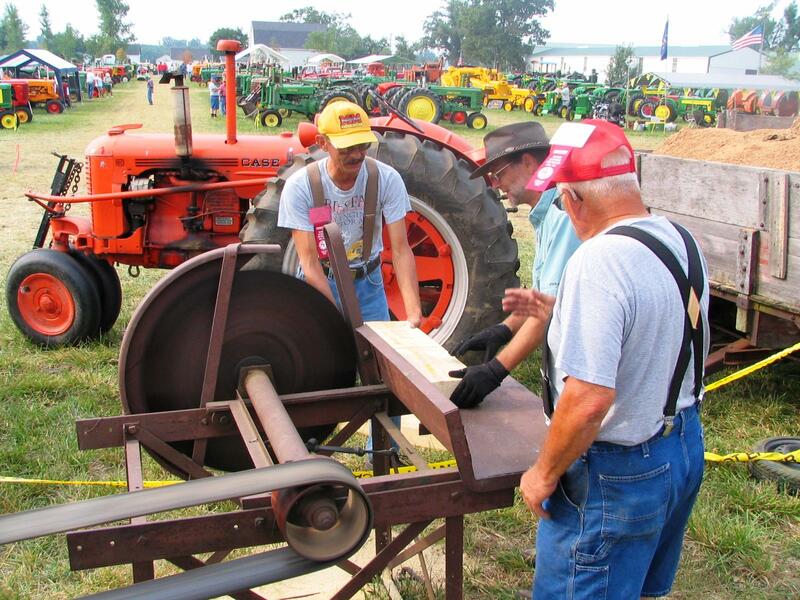 Gene Dotson, on his Case LA, talks with a visitor while powering a thresher for the Girard family harvesting demonstration at Portland in 2006. 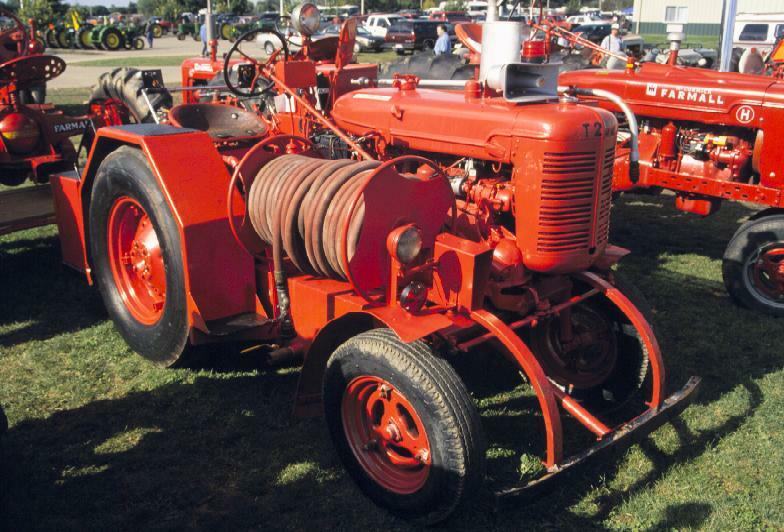 When farmers' demands for horsepower outpaced the manufacturers' designs, farmers would sometimes figure out ingenious tandem hookups. 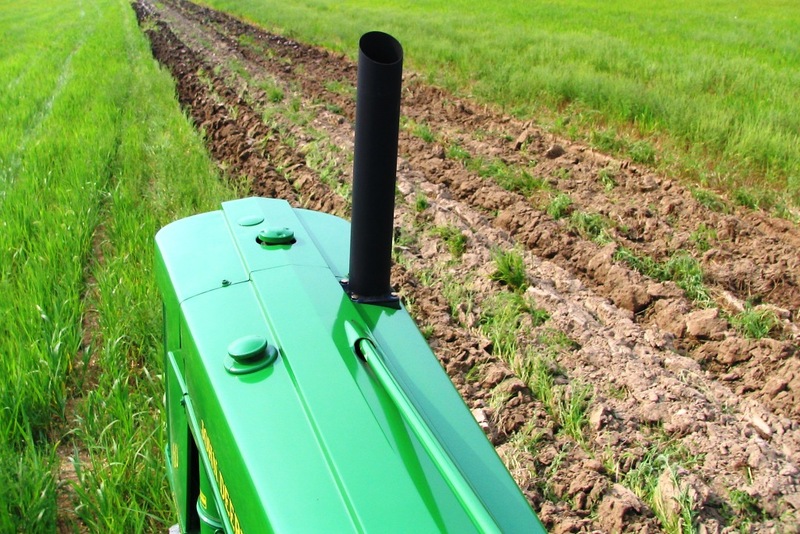 At Portland in August 2006, a John Deere 730 hooked in tandem with an 830 plowed a wide swath in one pass. 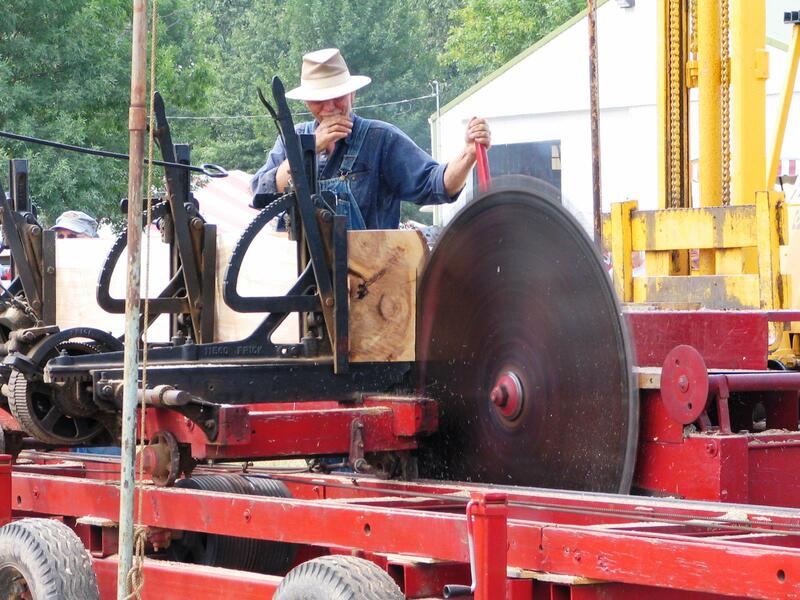 Sawing wood: With a buzzsaw (above left) powered by Steve Sewell's Minneapolis-Moline BF, and with a big sawmill powered by a steam tractor. 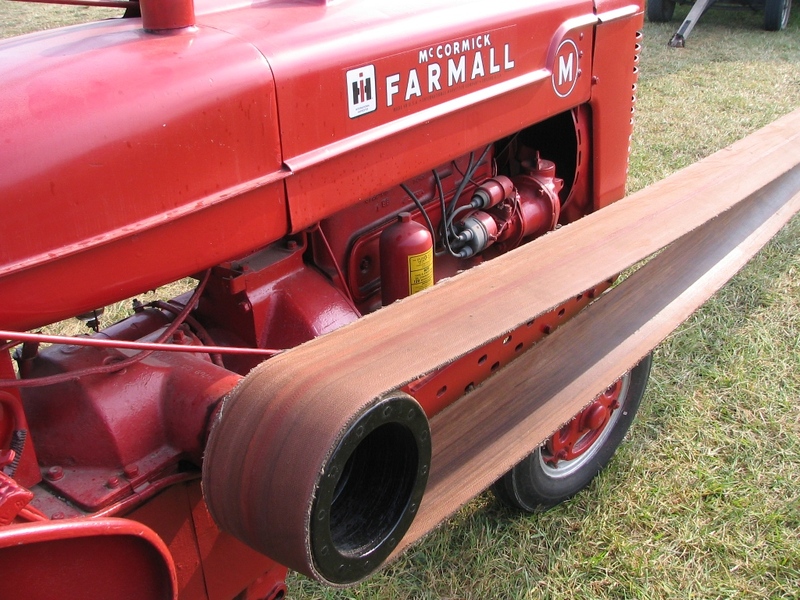 When the carriage slides those logs into that big blade, it really makes the steam tractor chuff. Below, some scenes from Portland 2008.